Sold by VOKUL Sports and Fulfilled by Amazon. Gift-wrap available. 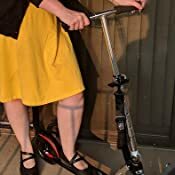 ✅ CONVENITENT GLIDE ANYWHERE: The Kick Scooter with 1 second Easy-Folding mechanism and lightweight 13lbs body will convenitent you to storage and transportation on subway,train or bus. 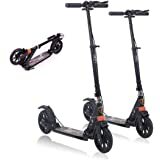 ✅ PRACTICAL LARGER WHEELS: Larger 200mm PU Scooter wheels + soft hand grips + scooter's suspension system which all features will greatly reduces vibrations whatever in Plain/Bumpy/Rough City or Urban Road. 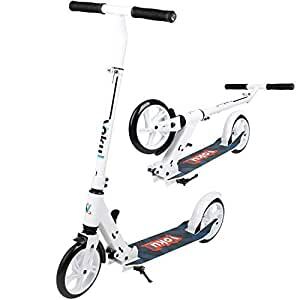 ✅ SIZE AND REAR BRAKE: Enough 21.3"L*5.5"W deck size suitable for foot space and low to ground design make push less ride more,effective braking will bring you more safe when riding. ✅ YOU WOULD'T REGRET WHEN DISCOVERD THIS ONE! 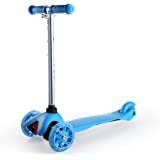 :The kick scooter with higher performance in comfortable size, Ride feeling, larger wheels, Construction and lightweight, Design and carry portability. 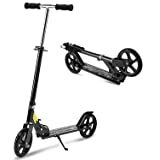 CONVENITENT GLIDE ANYWHERE: The Kick Scooter with 1 second Easy-Folding mechanism and lightweight 13lbs body will convenitent you to storage and transportation on subway,train or bus. 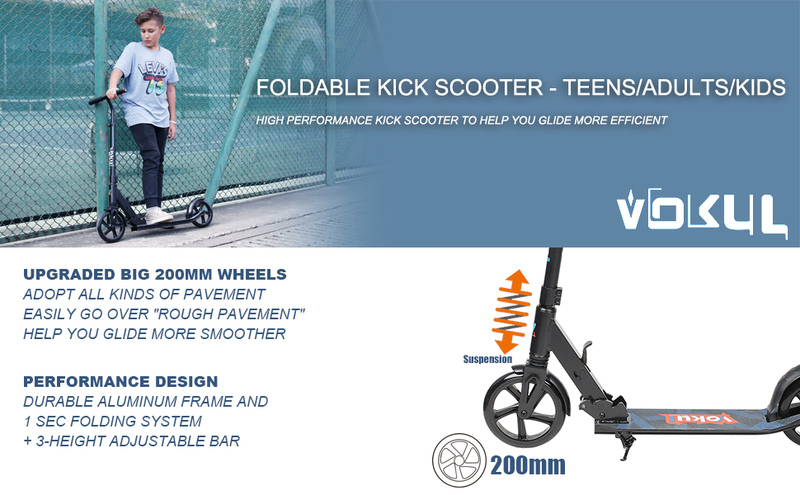 PRACTICAL LARGER WHEELS: Larger 200mm PU Scooter wheels + soft hand grips + scooter's suspension system which all features will greatly reduces vibrations whatever in Plain/Bumpy/Rough City or Urban Road. 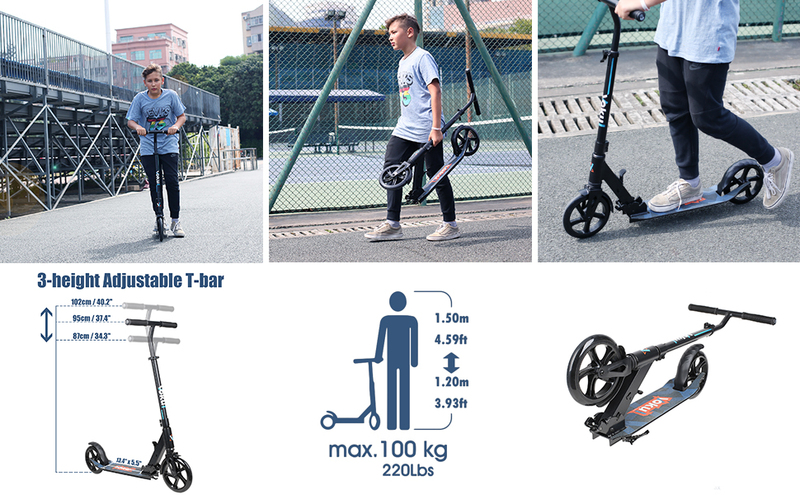 SIZE AND REAR BRAKE: Enough 21.3"L*5.5"W deck size suitable for foot space and low to ground design make push less ride more,effective braking will bring you more safe when riding. YOU WOULD'T REGRET WHEN DISCOVERD THIS ONE! 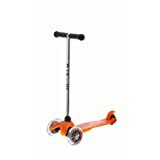 :The kick scooter with higher performance in comfortable size, Ride feeling, larger wheels, Construction and lightweight, Design and carry portability. 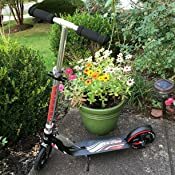 I needed a scooter to ride on sidewalks 10 minutes per day. I am 5'7 and about 150 pounds. I started with one of my kids Razors but the small wheels made it a bumpy ride. 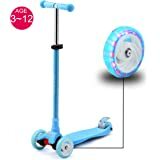 I wanted bigger wheel but still need a small scooter so i can take it with me on casual carpool. The Vokul vk-205 (in fact amazon sent me the scotter with different labels (hudora rx-205) which i suspect is the German model) folds fairly small and i can take it with me on casual carpool. The locking mechanism works well. The brakes don't work too well when it's wet outside. When riding on uneven pavement, there is kind of rattle. Not sure where it's coming from, maybe the straps. When folded, the front wheel still turns. it would have been better if it were locking in place so you can push it like a folded stroller. Also as some other people have commented, the kick stand does not work when the scooter is folder. 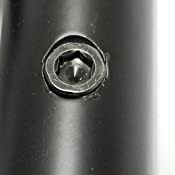 The handle bar slides out and there are 3 or 4 holes and a sprung pin . it can be adjusted to any place and locked in place with a collar similar to a bicycle seat. Overall very happy with the scooter. After 6 month the scooter is still running smoothly. Love it. Lightweight, works straight out of the box, and super FUN. I'm 61 y.o. and have a young dog. Poor guy, I can't go nearly as fast as he can. Not anymore! 😁 He's an Aussie, super smart, and we figured out how to do this together in no time. I'm still being careful when he darts in front. Put your free foot on the back fender to brake. -as with any scooter, watch out for bumps, cuz the front wheels will go over the bump, the platform bottoms out, and then so will you. 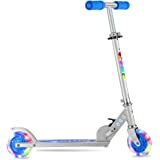 5.0 out of 5 starsGreat sturdy, light scooter. Very smooth ride. (4) High clearance (from the road). Many scooters had similar features but this one had a higher clearance, which was one of the features I was looking for. If you look closely at the Hudora, the platform and the center of the rear wheel are almost at the same level (aligned), whereas in other scooters the last portion of the platform bends upwards meaning that the foot rest was lower and closer to the floor. So, you can find other scooter with big wheels but with the diminished clearance due to their design they could get stuck in places that this one would not. 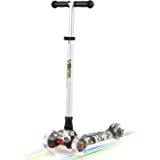 I used the scooter after I received it and it felt really sturdy, light, and it was a smooth ride (see video). My son also loves his new scooter. He asks to go out at every opportunity he has. 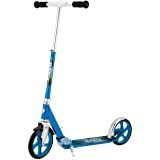 If you are looking for a nice scooter for your kids (or YOUR big kid spirit) this is an excellent choice. I know anyone will enjoy it. 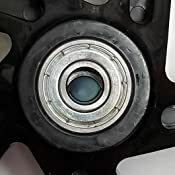 Thank you for reading and let me know if this review was helpful to you. This thing flies! 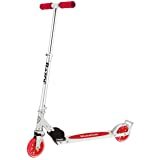 I don't think it coasts as long as the Razor scooters, but I don't have Razors with big wheels so it's not an exact comparison. It has much better coasting ability on very smooth pavement than on the paved bike trails near us. This is my only scooter that comes with an attached carrying strap, which is a very handy feature. The Hudora collapses easily when directed to, which is also a nice feature for me, as I have trouble collapsing my Razors. It's quick and easy to get in and out of the car. All in all, I'm pleased with this purchase. 5.0 out of 5 starsGreat commuter scooter! I just received this scooter a month ago, and have really been appreciating it (my first). 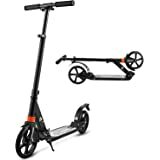 I bought the scooter to use for my commute from the train to workplace (2 miles each way) - it folds up in a snap (handle bars slide down easily and then folds in half with a clip), and fits in my car really easily or over my shoulder with the strap to carry upstairs into the office. 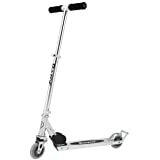 The wheels are sturdy enough for mostly pavement and some street surface when necessary. It arrived pre-assembled so I could take it out for a test drive as soon as it arrived. It has a kickstand which seems to work well but I don't seem to use that too much (it's so easy to rest the scooter against something when standing up). I hope it lasts for a while because it's more than I could have hoped for! Highly recommended, especially for the price.